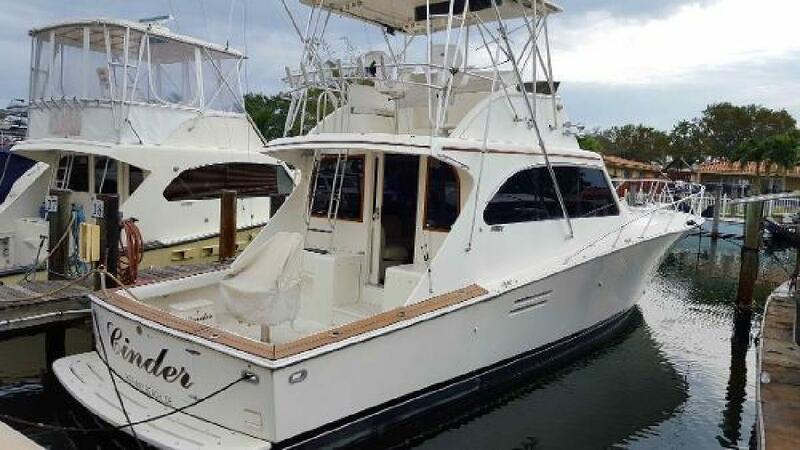 (LOCATION: North Miami FL) The Post 46 Sport Fisherman is a big, brawny, fishing machine with great styling, outstanding accommodations, and exceptional performance. This is a big convertible with roomy flybridge and versatile cockpit. The flybridge features hardtop, centerline helm station, twin helm chairs, and guest seating forward and to port. The helm features a full complement of electronics including: radar, GPS, autopilot, fishfinder, compass, and VHF radio. The bridge is equipped with outriggers, rocket launchers, and spreader lights. The large cockpit gives you more than enough workspace, and includes prep station with sink, livewell, tackle locker, fish boxes, fighting chair, transom door, saltwater wash down, and a cockpit freezer. The foredeck includes stainless steel bow rail, power davit, dinghy chocks, Given life raft, and bow pulpit with roller, anchor and windlass. The interior is large, open, and comfortable. The roomy salon has port side sofa with coffee table. To starboard is an L-shaped dinette with adjustable table, easy chair, and entertainment center with TV and sound system. Forward is a service bar overlooking the galley below. Just a couple steps down is a full galley with stand-up refrigerator/freezer, three-burner range, microwave oven, teak cabinets with solid surface counter with stainless steel sink. For overnight and extended fishing trips there are two staterooms. The master stateroom is to starboard with queen berth, hanging locker, bulkhead storage, overhead hatch, and private head compartment. The forward guest stateroom has offset high/low twin berths, under-berth storage, rope locker, hanging locker, and overhead hatch. The guest/day head has vanity, and shower. Performance is provided by twin Detroit Diesel turbocharged engines generating 550 horsepower each, with a top speed around 29 knots and a cruising speed of 25 knots. Mechanical features include: generator, reverse cycle HVAC, water heater, central vacuum, washer/dryer, and engine room fire suppression. She is a good-looking, well-equipped sport fisherman with tons of room. If you are serious about fishing in style or looking for an exceptional cruiser call now for more information and to schedule a showing of this 46’ Post Marine Sport Fisherman. Beam: 15 ft. 9 in.